Righr of table (back to front): Mike Leach, Jonathan Evans, Derek Mason, Richard Yeo. Charlie says: I managed with some effort to contact all 18 1992 winterers and assemble 13 for a reunion this year (being 20 years). Most travelled from the corners of England & Wales but Howard came from Thailand, Derek from Australia and Richard from Iceland, all specially for it. We had a fabulous dinner in the wardroom of RRS Discovery in Dundee and the majority made a debauched weekend of it, camping a night or two at my house. It was great to get together. 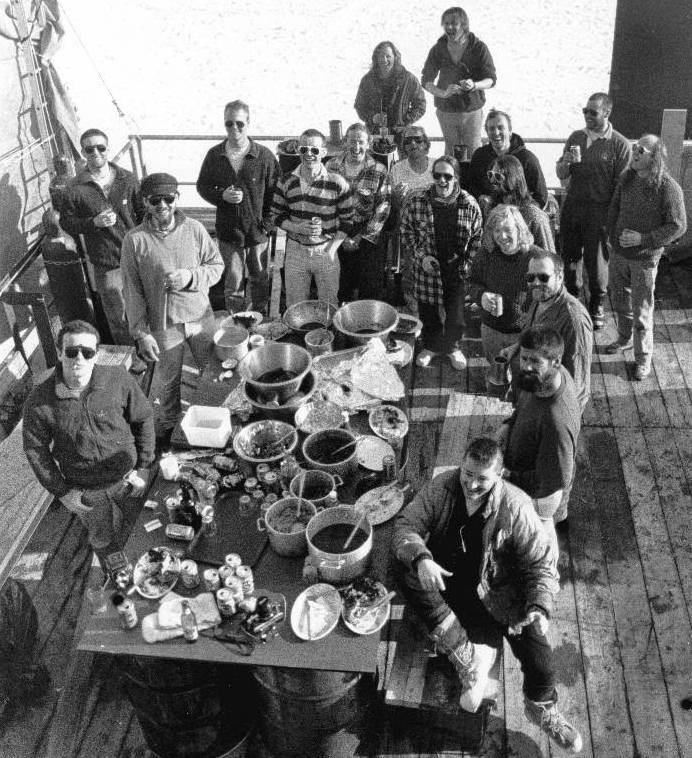 1992 was a pretty happy year as Halley winters go I think and by inviting winterers only it brought the winter family feeling back quite pleasantly, to the surprise of some perhaps. We attempted to recreate the scene of the base photo taken on the open platform of Z5. We disappointed a few summer & winter folks from around that time who heard about it and would have like to have come along, and there was talk of doing it again but bigger in the next few years. I don't know if that will ever happen, it sounds like a nice idea but I know it would be a mission to organise - even this small one seemed to take over for several weeks. 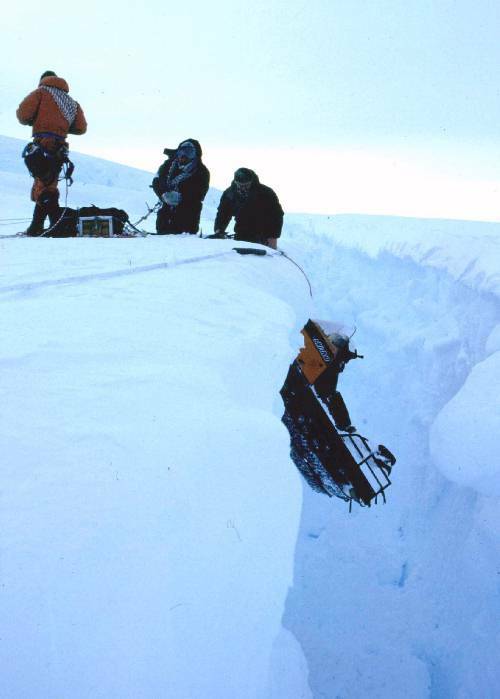 Charlie: "The photo is of us winching my skidoo out after a 30-foot dive into a tide crack in the Hinge Zone. I jumped off just as it was going in but of course got fired in after it anyway. It was a soft landing for both me and it fortunately. I have a good excuse for my incompetence in riding it into an obvious hole, we were instructed to never use the brakes on the base skidoos because they would jam on. So when I actually needed to use the brakes in this instance my subconscious stopped me! Honest!" "Endurance - crushed by the ice"